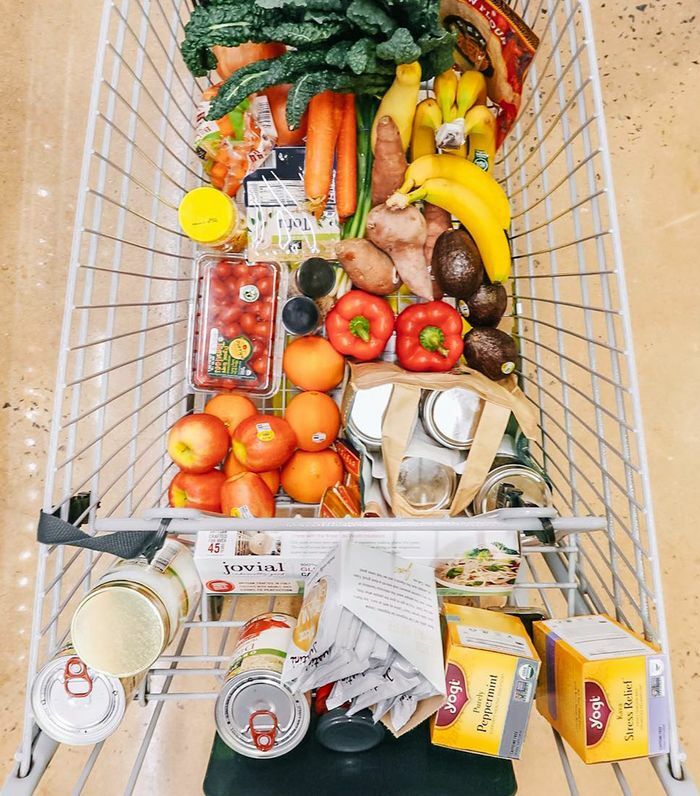 Welcome to our series #CartedByT30, where experts, influencers, and anyone who just really knows how to nail down a grocery list show us exactly what goes in their carts each week. Tune in to our Instagram Story on Sundays to walk down the aisle with them, and then shop out the products here. This week, health coach Kirsten Wessbecher shares her tips on getting the most bang for your buck at Whole Foods—plus the foods she always adds to her cart. Some people say Disneyland is the happiest place on earth, but for a wellness-obsessed nutrition nerd like myself, Whole Foods takes the win. Fun fact: In middle school, I asked my mom if I could have my birthday party at Whole Foods. Needless to say, my love and passion for healing clients through whole, nourishing foods lights me up inside to this day. Not only do I love making an impact through prevention and education, but I believe taste should not be sacrificed. Most importantly, nutrient-dense meals should accessible to everyone! That’s why I’m here to share my healthy eating tips on a budget. Unfortunately, Whole Foods does have a way of cleaning out your wallet if you're not careful. Luckily, I have some strategies to share when it comes to saving money there. Make sure to keep scrolling to see some of my favorite products, too! Being an Amazon Prime member is great for the free two-day shipping, but make sure you’re taking advantage of all the deals you can get at Whole Foods too. Simply whip out your phone, scan the barcode provided by the app, and your discount automatically populates. You can get an extra 10% off most sale items and gain access to exclusive deals each week. If you don’t have a Prime membership, you can still download the app and link it to a family member’s account or try a 30-day free trial. Beans, granola, seeds, superfoods, pasta, spices, nuts galore! You can find all of these items (plus so much more) in the bulk section of Whole Foods. Have an obscure recipe requiring just three brazil nuts and a teaspoon of sesame seeds? You can purchase the exact amount you need without having to pay for packaging or name-brand labels; it’s cheaper than buying online when you consider shipping (not to mention a whole lot more eco-friendly). You’ll also naturally have fresher spices by keeping smaller portions on your shelf. For certain items, you can ask an employee to cut whatever you’re buying in half (or whatever portion you need). For example, I cook for one, so buying a whole rotisserie chicken is a waste; I know I won’t finish it before it expires. I always ask someone working in the deli section for a half portion and they happily oblige. This goes for certain veggies too! Ever curious about a new product but don’t want to waste money on something you may not enjoy? Ask for a sample! Whole Foods has a generous “try before you buy” policy. This goes for literally anything in the store. Just last week, I was curious about a new hot-sauce flavor, so I asked an employee for help and he graciously gave me a sample cup. When you’re purchasing a piece of produce that has an outer layer (such as avocados, oranges, and bananas) and doesn’t need to be organic, buy conventional or opt for the Whole Foods’ 365 “everyday value” brand. These items are comparable in quality and often lower in price than competitor brands. This goes for packaged items and skincare as well! Let’s start with the container. Always opt for the smaller box. Not only does it help with portion control, but you’re less likely to pack in more heavy ingredients. As much as I love Whole Foods, the store definitely knows how to get your money. I’ve noticed it strategically chops salad-bar chicken into large pieces, for example. The same thing goes for the ridiculously large tofu pieces, whole hard-boiled eggs, thick mayonnaise-based pasta, tabouli, etc. Stay clear of these items while budgeting. When choosing water-based veggies like radishes, beets, and zucchini, make sure to shake the excess water off before adding them to your box. Lastly, always put your dressing in a to-go container so you’re not paying extra. From a health standpoint, I always have my dressing on the side to reduce unnecessary calories. I absolutely don’t count calories (how exhausting! ), but I’d rather add more protein or have a piece of dark chocolate after my meal rather than going crazy on dressing. Keep scrolling for some of my favorite budget-friendly items I always add to my Whole Foods cart. I always have this on hand, whether I’m drizzling it on roasted broccolini, asparagus, grilled peaches (a favorite summer dessert of mine), or a salad with high-quality olive oil. The chain’s 365 brand is delicious and costs about 25% less than its Newman’s Own competitor at Safeway. Since vinegar doesn’t spoil quickly, it’s worth stocking up on. As someone who eats dairy-free, I know how expensive buying clean nut milk can be. But if you stay on the lookout for Whole Foods sales, you can actually save a ton of money since nut milks go on sale quite frequently—including this brand. The reason I love Malk is because of how pure the ingredients are. The company doesn’t add nasty fillers or gums that cause stomach discomfort for many. Even when they’re not on sale, some versions are cheaper than comparable cartons at other stores. I always have frozen veggies and fruit on hand in case I don’t have the time to make a grocery run midweek. My go-to frozen recipe is a quick cauliflower “rice”–based stir-fry with coconut oil, any veggies I have in the freezer (usually broccoli, asparagus, frozen shrimp, butternut squash, peppers, and spinach), and whatever spices I’m feeling that day, topped with half an avocado for healthy fats. The 365 organic varieties cost between $3 and $5, which is a steal, especially for something that won’t go rancid in the freezer. Just for reference, a 16-ounce bag of 365 Everyday Value frozen green peas costs $1.99, and yellow corn is $1.79. Safeway sells the same-size bag for $2.79! I use almond butter in smoothies, baked goods, overnight oats, and my sugar-free almond butter cups with sea salt; sometimes I even scoop it straight from the jar for a pre-gym snack! Nut butters in general tend to add up fast, so I highly recommend this if you don’t have the time or patience to make your own. Avocados definitely rank high on my list of top-10 foods. I’m all about healthy fats for making my morning smoothies creamy, balancing blood sugar, aiding gut and brain health, and more. At Whole Foods, the pricing is $1.25 per avocado, compared to $2.29 at Safeway. You also don’t need to buy organic because the outer skin protects the avocados from pesticides. Pro tip: Buy avocados with bumpy skin because this means there have smaller pits, more avocado, and more bang for your buck. You can grab 5.3-ounce servings of Kite Hill ($1.99), and So Delicious coconut yogurt ($1.79), which is pretty legit when you compare it to the prices at Safeway: ($2.29, and $2.79, respectively). Always buy the unsweetened, plain version so you don’t have to worry about added sugar. Like it on the sweeter side? Add a bit of stevia and cacao powder. Want extra fiber? Try chia seeds, flax meal, or psyllium husk (a great prebiotic for the good bacteria in your gut). I love making zoodles from zucchini or spiralizing sweet potatoes, adding veggies, and topping my “pasta” off with sugar-free sauce. For reference, the 365 Everyday Value pasta sauce is $2.29, compared to Safeway’s O Organics version, which is $2.79 for the same-size jar. The high smoke point in coconut oil makes it great for sautéing and baking, but I also love using it as a lotion to hydrate my body and even my hair. Whole Foods offers a house-brand jar at $7 for 14 ounces (Safeway charges $8.39 for a jar of the same size). I always thought buying condiments would be much cheaper at big grocer like Safeway, but after some research, I was surprised to find that organic yellow mustard costs 18 cents per ounce at Whole Foods and 22 cents per ounce at Safeway. Organic ketchup is also more expensive at Safeway, where it sells for $2.29 for 20 ounces versus $2 for 24 ounces at Whole Foods.